SethBling is a master at making games do amazing things. He’s managed to inject the code for Flappy Bird into Super Mario World and created a bot that learned how to play Mario. Now, he’s built a working Atari 2600 emulator in Minecraft. And he’s done it all without any mods. The emulator runs Atari 2600 games like Donkey Kong and Space Invaders using a complex system of over 2,000 command blocks that plays actual Atari ROMs. They’re a little slow. The 2600 managed 60 frames per second. Seth’s emulator can do 60 frames every four hours. By the end of 18 hours, the first barrel in Donkey Kong has just reached the middle of the second platform. Seth explains the process in a second, more technical video. He builds cartridges using basic materials like stone and dirt, each block standing in for a certain binary value. He can use those blocks to assemble the code for games. After that? It’s the long process of using the allocated memory to draw the sprites. The data is occasionally drawn into the wrong spot on the screen but given the fact that this is an emulator that used Minecraft blocks that’s only a small setback. Seth has shared the world file for people who want to check it out for themselves, as well as an editor to help folks load in their own ROMs. 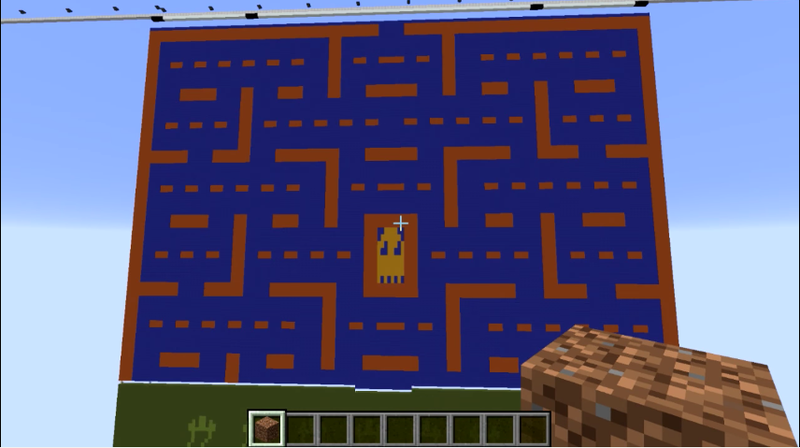 So, if you happen that have Atari ROMs laying about and are sick of seeing them run at normal speed, boot them up in Minecraft and sit down for the longer game of Pac-Man you’ll ever play.